Imagine you have to fly to a country far away and a plane is the only choice. Under what circumstances do you need to understand the various controls for flying the plane? Or the various signals that the pilot receives from the different control towers? Or how to operate the radio system? Not unless you’re a pilot or co-pilot. If you are just a passenger, you only need to understand is whether your need is being served, and for that you need to understand what you need in the first place. In the context of investing, when you are managing your investments yourself, you need to understand the stock, bond and money markets. However, if you decide to use the Mutual Funds for the purpose of investing to reach your financial goals, you need not understand how stocks, bond and money markets work. 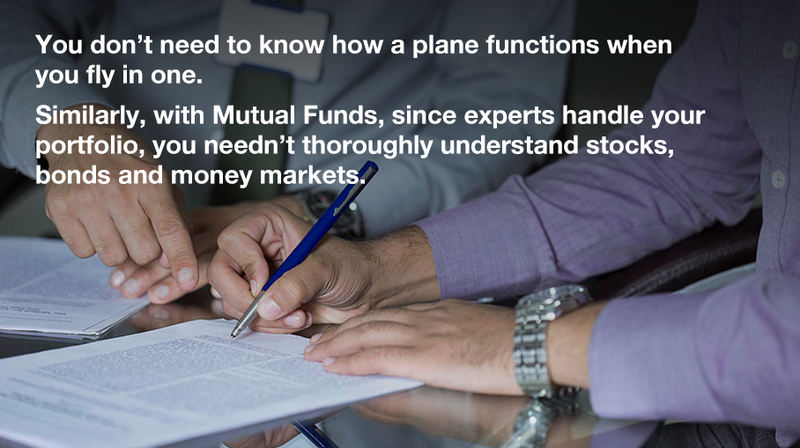 You only need to know what kind of Mutual Funds serve various purposes. Use Mutual Funds and let an expert fund management team take over the various controls of the vehicle. You just select the vehicle based on your journey and relax.